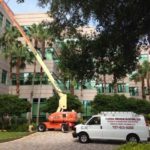 Florida Pro-Tech Painting is located in Clearwater, Florida, but services the greater Tampa Bay area (Licensed in Pinellas County, Hillsborough County & Pasco County). We provide professional painting and waterproofing services to commercial and residential clients large and small. Whether your job is a small home nestled on the shores of St. Petersburg or a corporate office building overlooking the bay, we offer punctual, on-time service and a quality finish that you’ll be happy with for years to come. Get a look that you’ll be proud of for years to come. Our waterproofing and painting services use the latest technology and are backed by our quality guarantee. Inside or out. 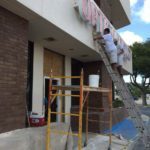 We can handle both the interior and exterior walls of your house, condominium, apartment complex, hotel, restaurant or other business.